A 12th century knight arrives through a portal. This episode's title, "Day for Knight", is a play on the movie-making term "day for night". The term is used to describe the technique of shooting film out-of-doors during the day but making it appear to be night. The simulation of night is usually achieved with blue camera filters, tungsten-based film stock, and under-exposure of the film (or a combination of these techniques). Early in the episode we see that the Porters have at least one real fishing pole and a home-made one of bamboo. 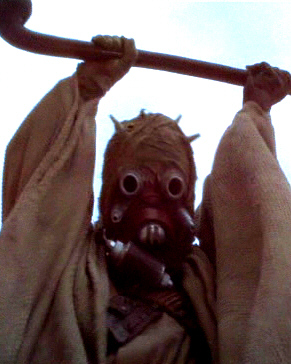 In the scene at 1:54-2:00 in the episode, as he's attacking Christa, Keeg shakes his club over his head two-handed in a gesture very similar to the scene in Star Wars: A New Hope of the Tusken Raider who is attacking Luke Skywalker. Was this an intentional homage by the episode's director, John Carl Buechler? The Sleestak seem to have a habit of applying nicknames to their foes. In this episode, they refer to Balen as the Ironface, due to the iron helmet he wears. In later episodes, they refer to Christa as Longhair and Kevin as Quickmouth. Do they also secretly refer to Annie by the same nickname her father has given her? That would be Sweetface, of course! Balen says he comes from the court of King Arthur. Realistically, the version of English spoken by a person from that time period would be unintelligible to your average modern English speaker. Scarface seems to chase Kevin and Balen at least a short distance from where the two humans throw the sword and bolos at him. 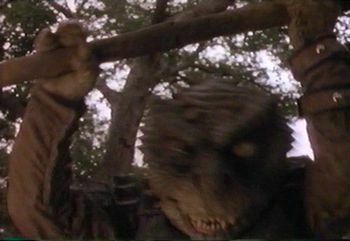 Yet, after they finally ditch the tyrannosaur by hiding in the rocks and foliage, they are able to pick up the weapons almost right in front of them. Balen gives Kevin the bolos as a token of gratitude. So, that's another item the Porters have in their arsenal of supplies. 12:52 Christa says, "Acuba ne." "Farewell." Near the end of the episode, the portal conveniently reappears so that Balen can return to Earth. Of course, Kevin is the only Porter present so only Balen can take the opportunity to leave the Land. But how does he know that this portal will actually lead to his own world and time? Unlike the time doorways of LOTL70, there is no vision of the destination in the fog.